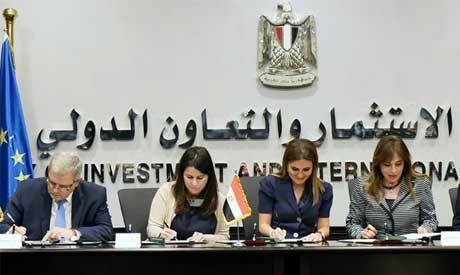 Egypt and the European Investment Bank (EIB) signed on Thursday a two-grant agreement worth 32 million euro to receive technical help and investments in infrastructure projects in Kafr El-Sheikh governorate, the Ministry of Investment and International Cooperation announced. According to a statement from Minister of Investment and International Cooperation Sahar Nasr, the grants would support sewage treatment projects and contribute to improving the lives of nearly half-a-million people in 79 villages in the central Delta governorate. Minister Nasr also explained that the construction of sewage treatment stations would take into consideration the increases in population and urban expansion, and create job opportunities in the sector. Nasr added that the ministry has managed to secure US1.5 billion to finance improvements in water and sewage treatment throughout Egypt. Meanwhile, Ulrich H. Brunnhuber, the head of diplomatic commission of the EIB, said that the bank was interested in supporting the strategic vision of the Egyptian government to improve water and sewage facilities, as well as to support expansion of infrastructure and small-to-medium sized enterprises (SMEs) in Egypt. Brunnhuber further noted that the investments of EIB in Egypt have reached 8.3 billion euro, financing more than 90 projects across the fields of energy, renewable energy, transportation, water, sewage, and SMEs.